Did you know that November is National Pomegranate Month? Chances are you’re seeing more of these healthy fruits at the market this time of year, and that’s because this month is peak pomegranate season. One thing that stumped us regarding the pretty pink-red fruit is how to get the sweet-tangy seeds out without spraying the entire kitchen with red juice. We think we figured it out. Slice off the ends of the fruit and along the flesh so that you can pull it apart without puncturing any of the seeds. Then start peeling the whole pockets of seeds from the flesh. Picking the seeds off one-by-one from the center of the fruit toward the flesh is time consuming and messy, so try out the method we described and let us know if it worked for you. The Pomegranate Council step-by-step guide is another helpful resource. We’ve all heard about how pomegranates are a “super food.” To explain what that means, Samantha did some research about why pomegranates are healthy and how they contribute to a healthy diet. During this cold and flu season, pomegranates can help supply a boost of Vitamin C. They are also good sources of potassium and fiber, although best known as a rich source of antioxidants, and when compared to other beverages, was found to one of the highest potencies – hence the super food claim. As we’ve mentioned previously, antioxidants are associated with decreasing disease risk, particularly cancer. Much of the research on the specific antioxidants in pomegranates has focused on its potential role in heart disease and prostate cancer, but primarily involves mice, not humans. The seeds, or arils, and the juice of the pomegranate can be used in multiple ways. 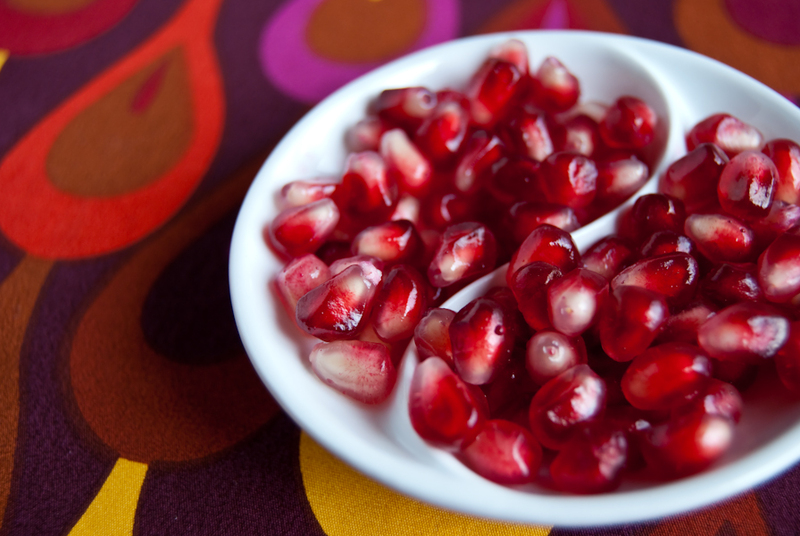 Once you’ve cracked open a tasty pomegranate, you can make juice, eat them raw or sprinkle the seeds on a salad. To make a sweet and savory salad, toss greens such as baby spinach with a bit of balsamic vinegar dressing to taste. Top with a sliced pear, sprinkling of walnuts and a generous handful of pomegranate seeds. But why stop there? Get creative and add a fillet of baked salmon, chopped red onion, apple slices, mandarin oranges and/or grilled chicken. What do you add to a healthy salad? How Stacey Got the Shot: In afternoon light by the window with the 18-55mm lens at 35mm, ISO 400, f/4.8, 1/100 second shutter speed.